…and a great night it was. He’s put a lot of work into the show and it’s paid off. I’ve always loved Nic’s cartoony/street art characters. At first glance they look quite cute, but the more time you spend with them, the more unsettling they become – just like good art should be. The images have got a slight manga-y feel to them and are a mixture of painting and collage, some with newspaper, and others with post office stickers. My favourite was the one called “TING” – there’s something about the mania of it, with the gesture of the hand and the word “TING” in large letters that really appeals to me. Stupidly I didn’t get a photograph of it. Although it’s not easy shooting framed works with a camera flash anyways, so perhaps it’s better that I didn’t. 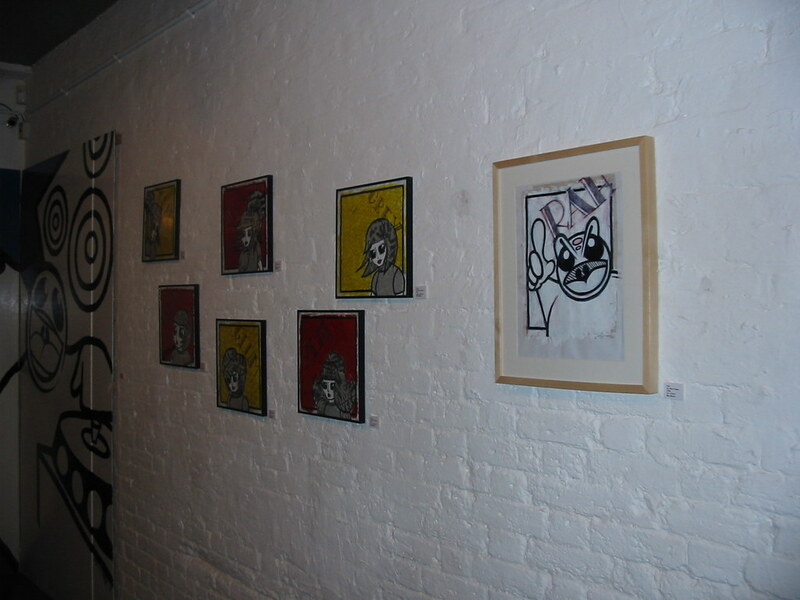 The show contained various small framed works, but the centrepiece of the show is the end wall of the room. 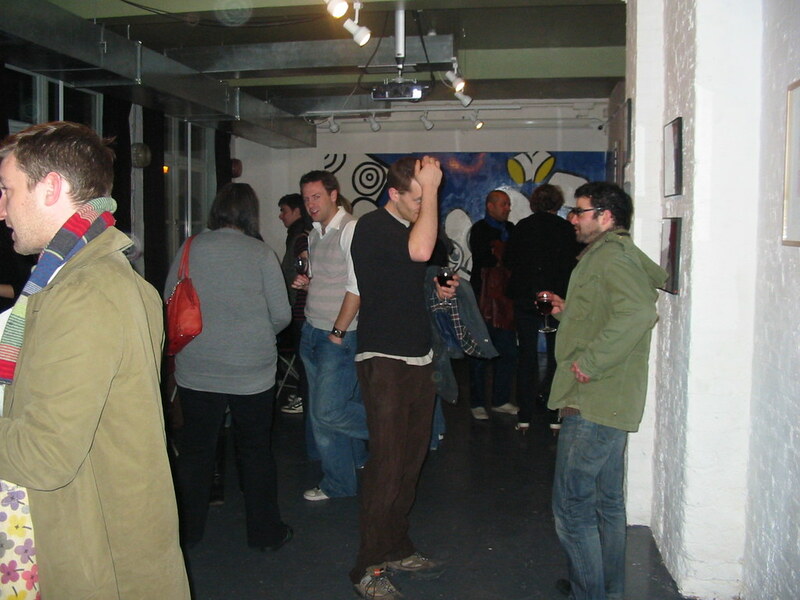 It’s taken up with a floor to ceiling mural (in the photo above) that Nic did for a commission, which the owner has thankfully lent back to the artist for the show. Apparently he’s sold about 5 of the works with another commission in the bag, so the kid done good. It might be worth picking up one or two of these before he takes off, as I really think he has the ability to go far. I wonder if he’ll bater a painting for one of mine..
Also – I had a nice chat with one of the co-owners of the venue, Paul Dungworth. 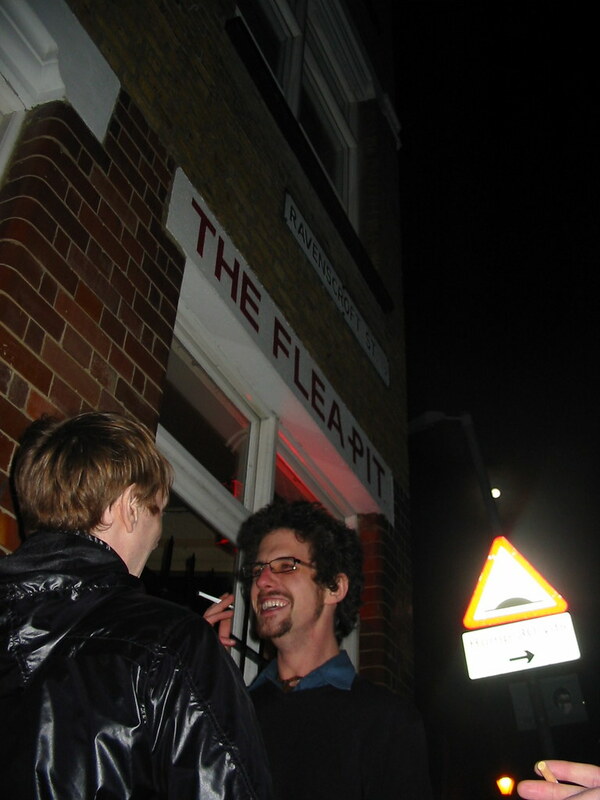 The Fleapit is one of those lovely venues that London is all about – a real find, slightly away from the Hoxton crowd, but still unmistakably Old Street. As well as free Wifi, good food, good art, and good music, they have a great selection of unusual ales, which is right up my street. I had the Power Station Porter beer (never miss a chance to sample Porter beers if you can). I also bought my mate Tim a rather unusual Mexican dark ale. It came in a bottle that was possibly the most phallic I’ve ever witnessed. You’ll have to ask Tim how it tasted. The show runs from now until 15th of April, so go see.